As one of the anchoring cities of the beautiful Basque Country, San Sebastián boasts a trendy, cosmopolitan vibe while still harboring a relaxed, coastal charm. Visiting La Concha Beach and Ondarreta Beach will get you outdoors. Visit Casco Viejo and Colegiata de Roncesvalles for their historical value. Explore San Sebastian - Donostia's surroundings by going to Bilbao (La Ribera Market, Basilica of Begona, & more) and Historic Center of Hondarribia (in Hondarribia). And it doesn't end there: wander the streets of Parte Vieja, see the interesting displays at San Telmo Museoa, step into the grandiose world of Miramar Palace, and admire the landmark architecture of Iglesia de Santa María. To find reviews, traveler tips, other places to visit, and more tourist information, refer to the San Sebastian - Donostia trip itinerary builder. If you are flying in from United Kingdom, the closest major airports are Bilbao Airport, Santander Airport and Zaragoza Air Base. 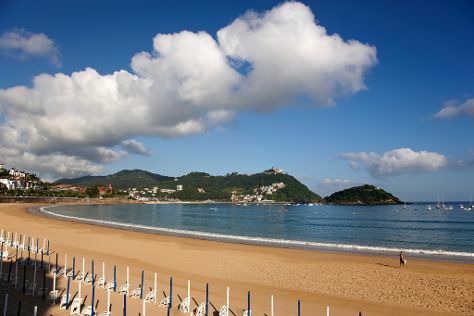 In March, daytime highs in San Sebastian - Donostia are 17°C, while nighttime lows are 8°C. Finish up your sightseeing early on the 2nd (Sun) so you can travel back home.